Dig for gold, hoist your axe, and create a gruff tough heavily bearded name for all your adventuring requirements with our fantasy dwarf name generator! We also have dwarf generators for Lord of the Rings, and Warhammer. 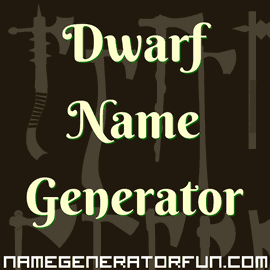 Our generator creates dwarven names for males and females of all ages, and can be used to create fantasy names for World of Warcraft, Dungeons and Dragons, Warhammer, or to make any fantasy dwarf name. There are a few dwarf name generators around already, but we couldn't find one that gave the option to create both random names, and names unique to the user. Dwarfs originally appeared in German and Norse folklore, and were often wise beings who lived in mountains or underground, and were experts at crafting and mining. Norse mythology actually gives different origins for the dwarfs – in some stories they're born from the blood of Brimir and the bones of Blainn, while other stories say that four dwarfs are responsible for holding up the sky. It's theorized by some scholars that dwarfs weren't originally thought of as small, and that this idea developed thanks to Christian influences on Norse mythology suggesting that dwarfs were 'lesser' spiritual creatures, which eventually translated into 'smaller'. Dwarfs were almost always bearded, and had the ability to make themselves invisible, while many stories would feature both male and female dwarfs lusting after the tale's human protagonists. A large number of these stories were eventually collected together and popularized by the Brothers Grimm, most notably with the Seven Dwarfs in 'Snow White', which went on to inspire the legendary Disney animation. Tolkien's portrayal of dwarves has been massively influential, with similar races appearing in dozens of fantasy sagas. They have ended up one of the biggest elements of Dungeons & Dragons, still one of the most significant tabletop role-playing games around, and this also led to their inclusion in the dark and gothic world of Games Workshop's Warhammer universe. They are also a key element of Terry Pratchett's Discworld novels, playing a major role in a number of the novels including Guards! Guards!, Men At Arms and Feet of Clay. In movies, aside from Disney's iconic Seven Dwarfs, Tolkien also looms large, with Gimli from The Lord of the Rings trilogy being the most significant dwarf character of recent times, alongside Thorin Oakenshield and his twelve compatriots in The Hobbit trilogy. There are also the grungier Seven Dwarfs from Snow White & The Huntsmen (2012), the titular character from Willow (1985), the anarchic criminals from the cult classic Time Bandits (1981), the dwarves of Warcraft (2016), and many more!